Since I saw my first Sci-Fi movie flicks, I wanted to have the technology they were using. I still haven’t touched or seen flying spaceships at that scale, teleporting devices, robots that can dance or other similar gadgets. However, I have found a piece of that dream incorporated in Windows Vista's Windows Speech Recognition application. This tool tries to understand what you are saying and converts spoken words to machine-readable input such as key presses or Windows commands, thus limiting the need for using the mouse and keyboard. In this tutorial I will show you how to set up Windows Speech Recognition, learn how to use it and give you some information about common issues with this application. 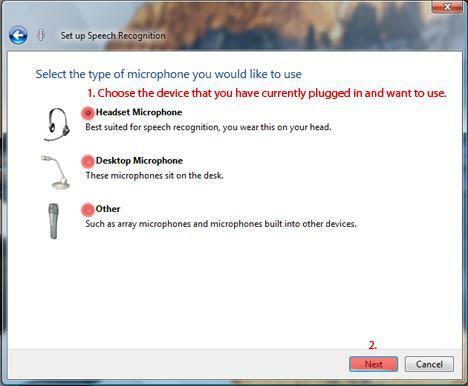 In order to use Windows Speech Recognition you need a microphone. To learn how to set it up, read our guide on How To Install and Setup a Microphone. 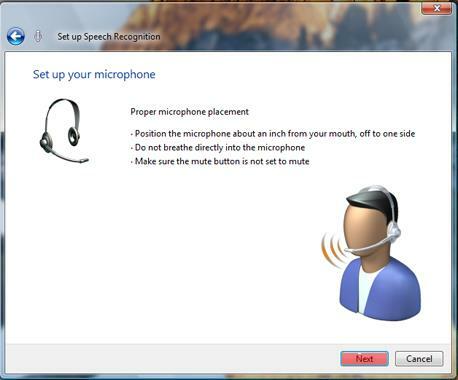 Once you have set up your microphone, you need to train Windows Speech Recognition to understand your voice. To do this, open the Control Panel window and click on Ease of Access. 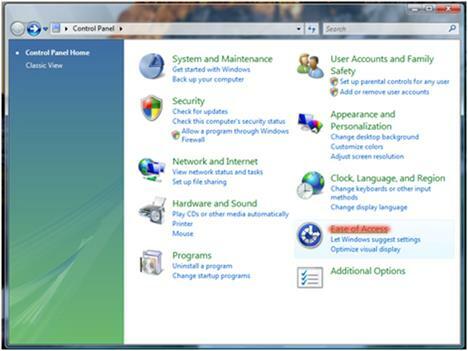 If you are using the Classic Control Panel, go to Control Panel -> Ease of Access Center. 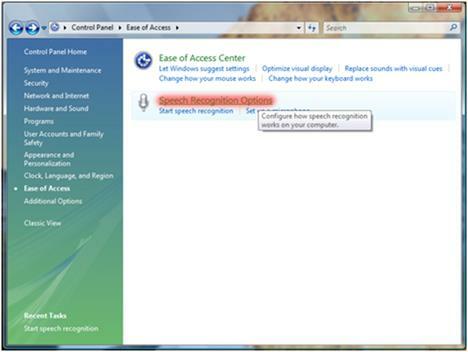 When you are in the Ease of Access window, click on Speech Recognition Options. 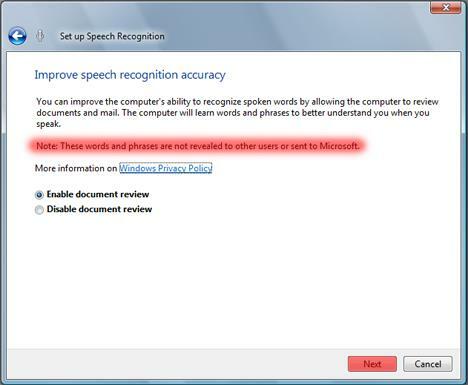 In the Speech Recognition Options window, click on Start Speech Recognition. A setup wizard will appear. To start the configuration, click on the Next button. Choose the microphone device that you currently use and click on the Next button. A few indications are given and, if followed, they'll give you a better experience. In my case, since I have selected the headset microphone, the indications are as shown below. Once you have read and followed the given advice, click the Next button. Note: If you accidentally selected the wrong device or you just want to go back to a previous page of the setup, click on the blue Back arrow at the top left corner of the setup wizard window. Read the given text aloud and after that, click the Next button. This procedure seems to be a bit error prone so you might want to repeat it a couple of times and adjust the position of the microphone and its distance from the speakers. 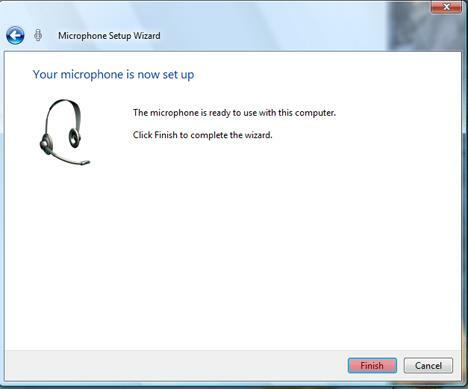 Note: If you have already tried a couple of times and the microphone still didn't seem to work, close the wizard and double check our guide on How To Install and Setup a Microphone. Once the microphone is setup correctly, restart the procedure described in this article. If you read the text and click the Next button, the wizard will tell you that the microphone has been setup. Click on the Finish button. After the microphone is setup, the wizard will try to improve the speech recognition accuracy. The setup wizard will ask your permission to let the application improve itself by using texts from your documents or mail. After you select the option you want, click Next. 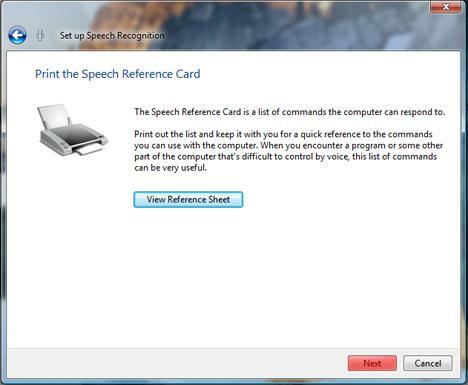 Now the wizard will give you a speech reference card which contains the list of commands the computer will respond to. If you click on View Reference Sheet, you can see the commands and also print them. Note: The Reference Sheet can be read and printed at any further time, simply by going to Control Panel -> Ease of Access -> Speech Recognition Options -> Open the Speech Reference Card. 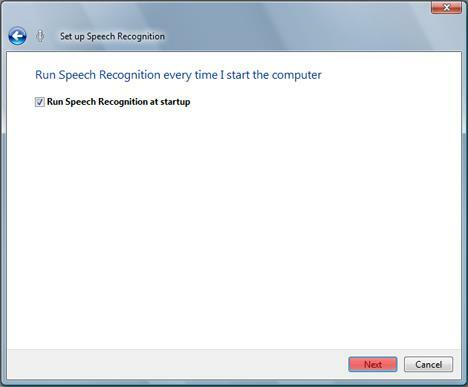 You can make the application start up every time you start Windows Vista by checking the 'Run Speech Recognition at startup' option. If you leave it unchecked, the application will have to be started manually each time you want to use it. Once you are done with the setup, you will be asked to go through a tutorial and learn how to use it. Click on the Start Tutorial button to enter. IMPORTANT: We will not give you any indications about the content found in the tutorial. We think that the tutorial is well written and contains all the information you need. Please reserve 10-15 minutes to go through it. Even though it might seem frustrating at first, you will be satisfied with the results. 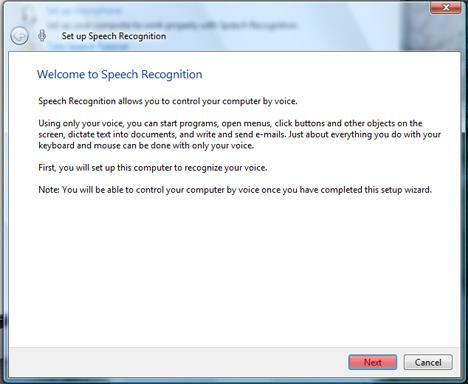 If you have finished the tutorial and you think Windows Speech Recognition is not hearing your voice commands well enough, you can take the same tutorial again. 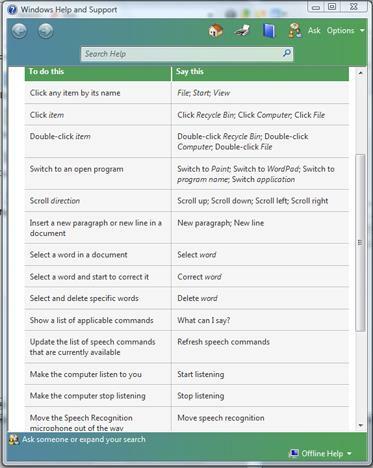 To do this, go to Speech Recognition Options and click on Take Speech Tutorial. 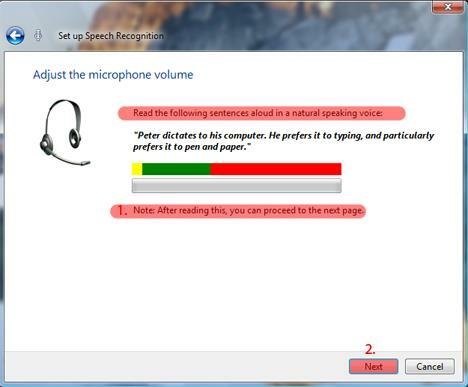 If you have gone through the tutorial, but you still feel the need to improve the way Windows Speech Recognition works, you can take another tutorial based on reading texts. To open and use this text based tutorial, click on 'Train you computer to better understand you' located in the Speech Recognition Options window. Recommendation: Go through the 'Train your computer to better understand you' tutorial more than once. Even if you make mistakes the first couple of times, in less than 3 days with 2 hours a day, you will wonder how you could have lived without this great application. Instead of closing the application, just say stop listening or press the Control + Windows sign from your keyboard. Some applications may not work with Windows Speech Recognition. This is because applications must have support for Text Services Framework. The framework was built by Microsoft to enable advanced text input, speech recognition, hand writing and multilingual support into applications. So, if application developers didn’t include the Text Services Framework when they built their application, Windows Speech Recognition will not work properly with their application. 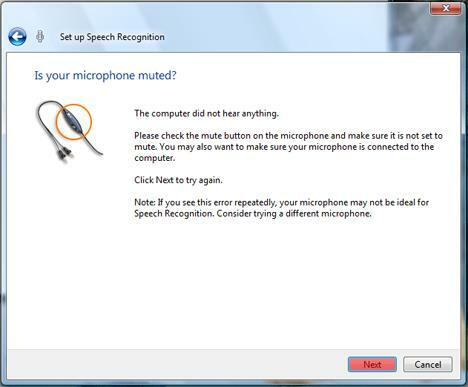 Windows Speech Recognition is not working when UAC (User Account Control) warnings appear. In such cases, use the mouse or keyboard to select the UAC option you want. Can you use this application as a 'Speech to Text' tool? Speaking into a microphone and watching your words be typed in Notepad r something like that. This is exactly what it does. if you would like to learn more about speech related tools and support from Microsoft, Pleas visit the Microsoft Speech Online Community. I have had RSI for some time now, and thought Windows 7 speech recognition would be the solution for my tendinitis. 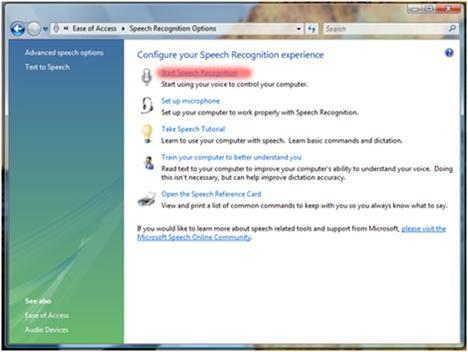 However, the Windows 7 speech recognition has some serious limitations, specially if you want to click anywhere on the screen. I settled upon an extension for Win 7 called Voice Finger ( http://voicefinger.cozendey.com ), that somehow fill the gaps in Win 7 recognition. I am trying to use Speech Recognition on Windows 7 to save my fingers! It's amazingly good some of the time. However, I keep having trouble with "commands" interrupting my dictation. eg I wanted to write, " he used to write" but when I said "write" the computer immediately interpreted this as the command "right" and took me off to right justification! There are all sorts of commands which the computer "understands" - cancel, select, delete etc. How does one actually get the computer to type these words if you want them included in your dictation?